The roots of the word "introduction" mean "bringing into existence" , and that's what we're doing with our classes at the beginning of a new school year. The roots of the word "introduction" mean "bringing into existence" , and that's what we're doing with our classes at the beginning of a new school year. And, as we bring them "into existence," one challenge we face is will be help develop a "community of learners" or a "classroom of students." The first step in developing the former is helping students build relationships. A first step I use with my students is to immediately have them create a "Who Am I?" poster on the first and second day of class, along with bringing in three items that represent something important to them. You can download the planning sheet that students use here. Basically, they have to share their loves, worries, sadness's, hopes and dreams and successes - in writing and in pictures. The planning sheet supplies sentence starters, and new English Language Learner Beginners can draw pictures only. Students then share their three items and poster orally “speed-dating” style (linking up in rows, show and share, and then one row moves to the right — or left — does it again, and so on). I also encourage students to try and ask each partner at least one question about their poster. Afterwards, we hang the posters on the classroom walls. It's not earthshaking pedagogy, but it does provide opportunities for reading, writing, speaking and listening in English. Most importantly, though, it provides an opportunity to building the critical foundation for a successful school year -- relationships! 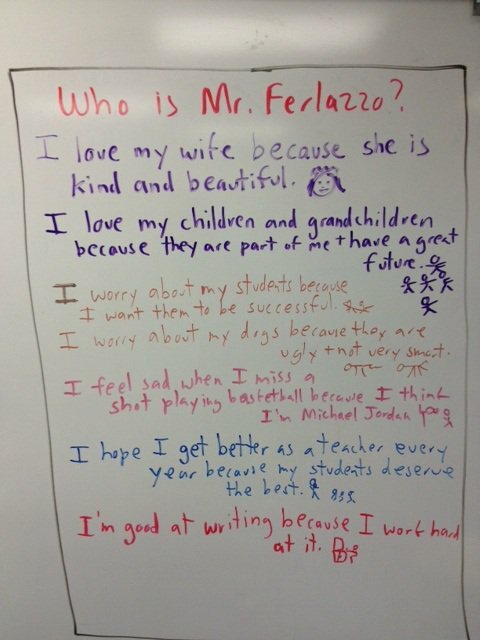 Larry Ferlazzo teaches English and Social Studies at Luther Burbank High School in Sacramento, California. He has written six books on education, writes a teacher advice blog for Education Week Teacher, and has his own popular resource-sharing blog. He writes a monthly post for the New York Times on teaching English Language Learners.